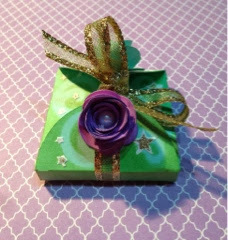 I was inspired by so many challenges this week to create this fun, colourful box and card with the Art Philosophy Cricut cartridge. 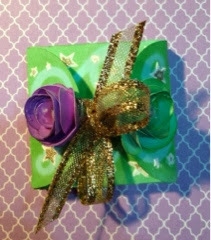 I chose a Mardi Gras inspired theme and used the colours green, purple and gold. I cut a scroll from the same cartridge and used it as a stencil, inking around it with Distress Ink on the top flaps of the box and the front of the card. I sponged ink on the edge of the card and sides of the box and added Perfect Pearls for shimmer. I stenciled on stars with a Heidi Swapp stencil and homemade texture paste, and then added gold embossing powder. Inside I used the Simon Says Stamp sentiment from the set that came with the February 2014 card kit, embossed in gold. 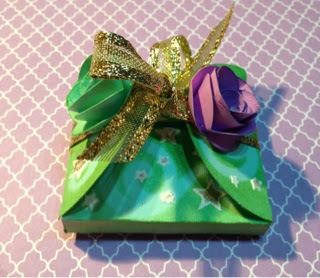 I added gold ribbon to tie the box closed and green and purple flowers, cut with the same cartridge again, into which I placed a pearl in each centre. I usually don't incorporate so many challenges, but this fit together perfectly! Exploring Cricut - http://exploringcricut.blogspot.ca/2014/02/challenge-time-at-exploring-cricut.html?m=1 - Create a box, tag or bag and add a ribbon. When I started thinking about this project I wasn't sure where to go with it. I'm not sure that I have a specific favourite colour- but my fav style right now is mixed media, and I love Christmas, so that's how this piece started. For a swap I'm participating in this month we were to create a piece featuring a quote from a movie, and I chose this one from the movie Elf. I was inspired by an art journal page by the very talented Vicky Papaioannou. I first started by mod-podging a piece of tissue paper to a 5x7 background and then used some homemade texture paste to stencil on a background of stars with a Heidi Swapp stencil. I used the Art Philosophy Cricut cart to cut the presents out of Heidi Swapp's Believe papers, and used sparkly watercolour paints on watercolour paper to colour the bows. I then glued some baker's twine to each present and used Distress markers to add shadows. The soldier is a Tim Holtz stamp I stamped on watercolour paper and coloured with Distress markers. I cut the holly and berries from the Stretch Your Imagination cartridge and added Stickles, highlights with white gel pen and shadows with Distress markers. The music notes are cut from the Gypsy Wandering cartridge, painted with sparkly black paint and highlighted with white gel pen. I printed my quote and cut it into strips and glued it onto a card from the Believe collection, first punching the top with a notebook punch before mod-podging it onto the background. I traced around all the pieces I added with a black permanent pen to give it depth. I hope you all have a very cheerful week, and be sure to join us over at the FCCB blog to check out what the rest of the design team has created and to link up your creation! Since I'm really needing a boost of spring - it's been so cold here! - I decided to use the mason jar cut from my new Kate's ABC's Cricut cartridge. This is such an adorable cartridge and I can see myself using it a lot. I love the way there is so many layers to create a very detailed die cut! I used some Stickles to add sparkle to the cuts. The jar is popped up on foam dots - you can see the dimension from the side view. Inside - I used some of the paper from the front and two of the extra butterflies, and a sentiment from Marks Finest Papers and Stamps Primitive Stamp Set. 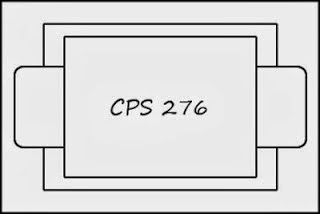 Be sure to check out the challenge over at FCCB and see what amazing projects the other design team members came up with. Then get out your supplies and start creating! 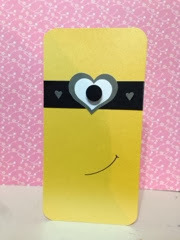 I had already made a valentine for my wonderful hubby, but at the last minute decided to create a funny Minion Valentine. After searching Pinterest - how did we ever survive without this - I was inspired to make this guy! I die cut the black circle and hearts from George and Basic Shapes Cricut cartridge, centering a second heart inside the grey heart with my Gypsy and layering it on a white heart. I punched mini grey hearts from cardstock and glued them onto the black strip and then popped up the black eye with a foam dot and drew on a little mouth. Inside - I thought up the pun and printed it on computer paper and just cut it to size. This card fits into a standard long envelope, which I decorated with punched hearts. Hope you are all having a relaxing Sunday! I totally have to finish my swap projects for this month with Lefty Productions, which I'm excited to post in the coming days! 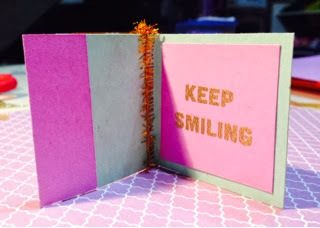 I just have to share these awesome Make n Takes I recently made with Scrapendipity! The first is a beautiful box we made with the We R Memory Keepers Box Punch Board. We decorated the top with a paper flower, doily, and a little tag. We added lace around the top edge and a double tied bow on one side. We put washi tape around the bottom and 3 gems on each side. This past Thursday we made this amazing folded die cut card. Each piece is cut separately and then attached together, with layered papers and I (heart) U embellishments. We stamped the music note background with Versamark and then brushed on Perfect Pearls - so pretty! A key with a ribbon attached is glued to the front. My wonderful husband gave me beautiful roses for Valentines! Erica gives her Valentine bear a hug. Poor Amie was sick, so she spent the morning curled up on the couch. I hope you all had a very happy Valentines Day! I cut this cute bee from the Create A Critter cartridge and added sparkles on the wings and heart with a Gelly Roll clear sparkly pen. I layered her over a die cut heart and a strip of pink paper border punched with a lacy edge. The card is cut from the Art Philosophy cartridge. I ran the heart, cut from the George and Basic Shapes cartridge through my Cuttlebug to emboss it and added a pink Prima flower. I stamped the Bee Mine, from a CTMH set with white embossing powder on vellum and added some white Ranger Enamel Accents dots. Inside - I staggered the Love layer to create a shadow and added some white highlights. I'm sure my 2 year old is going to love this card for Valentines! Another valentine inspired by the talented Sarah Moerman at My Impressions, using the Simon Says Stamp January 2014 kit! I used the Fancy Pants papers and tickets included in the kit and tied the twine around the top of the tickets before attaching them to the card front. I used some Bo Bunny valentine stamps to stamp the heart and banner onto patterned paper and then hand cut out around them. I popped up the heart and then added a strip of patterned paper cut into a banner across the front. I used the rest of the patterned paper strip inside the card and stamped my sentiment with the Simon Says Stamp set. 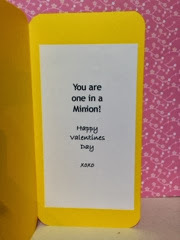 This year I made the most valentines I've ever made! I used the Simon Says Stamp January kit for a lot of them - it was such a great bunch of supplies all in one box :). 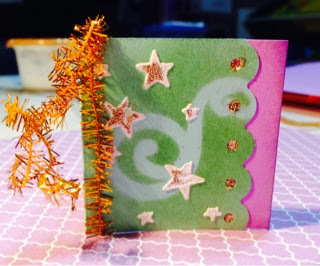 I pulled inspiration for this card from Sarah Moerman's blog, My Impressions. I used the Fancy Pants 6x6 papers on the front and layered them on some Kraft cardstock and rounded the corners. I heat embossed the stitching and I <3 U sentiment and layered the Fancy Pants valentine tickets inside the vellum envelope. Inside I layered some more strips of papers and another ticket. Winner will receive the Got Candy stamp set. To qualify for the prize, be sure to use at least 1 Cricut cut on your project and if it's not obvious, let us know what cartridge you used. I hope that you will all visit FCCB and join in this week's challenge. I cut the cute flying heart, postage stamp and Love sentiment from the Create A Critter cartridge and stamped the face with a Peachy Kean stamp. I layered these over a pink background, which I border punched for a lacy look. I added the white swirl, cut from the Straight From The Nest cartridge on the bottom left. The wings are popped up with foam dots and a pink pop of colour for the cheeks. I ran the Love die cut through the Swiss Dots embossing folder. Inside - cut from a 6x6 Fancy Pants paper. Head over to the FCCB blog and check out the amazing designs from the rest of the design team. Then, upload your own Red (or pink) and White project!